The post received more than 147 likes and several comments from students sharing similar thoughts. “I was incredibly hurt by how incredibly dehumanizing it was to anyone who feels or experiences threats, especially physical ones, to their bodies and their safety,” Penn said in a Facebook message to The Miami Hurricane. Earl Generato, a junior biomedical engineering major who is also a member of SpectrUM, said he found the sign offensive because it promoted an idea that goes against what the student organization suite area of the Shalala Student Center represents: diversity of all kinds. The Federación de Estudiantes Cubanos (Federation of Cuban Students), Council of International Student Organizations and United Black Students all have offices nearby. “Signs like that are for children, for people who can’t understand the ways of other people and are not willing to see the perspective of other people,” he said. Generato said safe spaces are not just a place for students to feel comfortable sharing their ideas. He said they are places for learning about the struggles others face and growing in empathy. “We are all going through our own problems and we should all support each other,” he said. “College Republicans in no way endorses hatred or abuse of any kind. 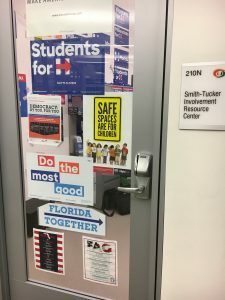 However, the sign will stay up because the movement for safe spaces on college campuses has been hijacked and transformed from an earnest effort to protect victims of abuse into a closed-minded crusade to shut out all ideological dissent. We are proud that our campus is exceptionally welcoming and accepting of people of diverse backgrounds, rendering safe spaces from hatred superfluous. Furthermore we are disturbed that nevertheless some members of our community would attempt to abuse this idea to insulate themselves from contrary thought. If someone does not want to hear opposing points of view and they want to be kept safe from ideas that they may disagree with there are better places to be than on a college campus. The danger of this is that universities will no longer be places where ideas can be freely exchanged and challenged. It is imperative that we do not support the creation of intellectual safe spaces where individuals can escape from ideas and perspectives that differ from their own. 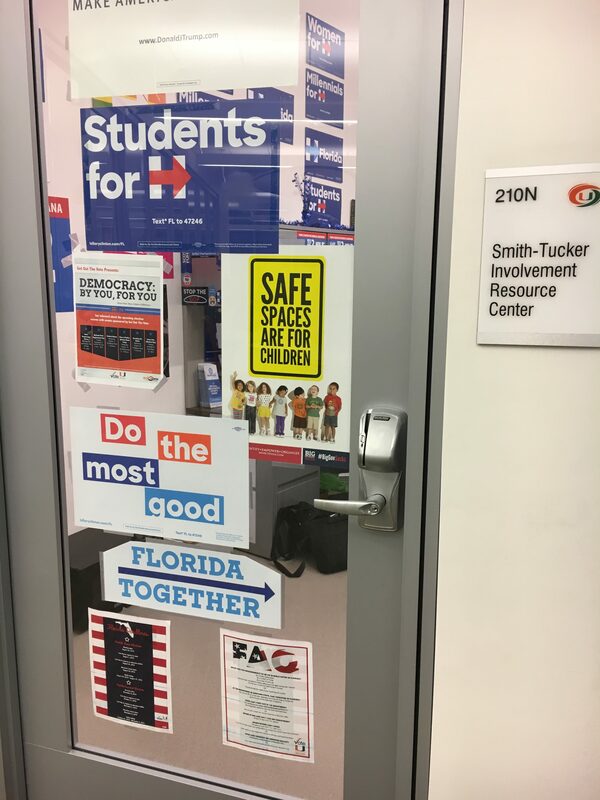 On a larger scale, this is dangerous for America because UM is not a daycare and neither is the real world; there are no safe spaces in the real world. People should be more open-minded to ideas that are not their own. Scrubbing our campus clean of differing view points is the antithesis of what a university should be. Amanda Herrera contributed to reporting.